If you’re planning on going out for dinner this weekend, you just might want to check out Festejos Bar and Grill on Main Street. With its bright decorations and fresh ingredients, Festejos has gained quite a bit of popularity from Clayton, NC home buyers. Find out why this Mexican restaurant is such a hit. Alambre – A steak dish with onions, peppers, bacon and guacamole. Camarones con Mole – Shrimp served with mole sauce. Mojarra Frita – Whole, seasoned tilapia. Filete a la Veracruz – White fish fillet topped with tomatoes, herbs and olives. Del Huerto Burrito – Vegetarian burrito with zucchini, peppers, mushrooms, squash, spinach, tomatoes and cheese. Parrilladas a la Albanil – Pork chops with hot sauce, sausage, beans, potatoes, onions and white cheese. Molcajetes – Sausage, chicken strips, pork, nopales cactus, onions, beans and cheese. Mexican Pizza – Sausage, refried beans, jalapeno peppers and cheese on top of a tortilla. Festejos prides itself on preparing everything right in the restaurant, which includes their own hand-made tortillas, sausages and desserts. One of their most popular services is the table-side guacamole preparation. 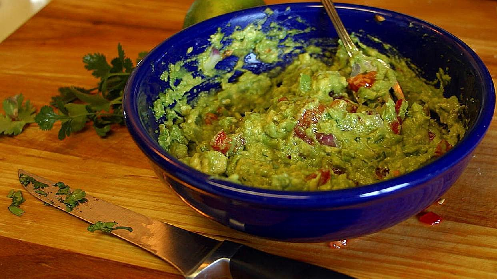 You can even find the recipe to their guacamole on their website. What Do Clayton, NC Home Buyers Think of Festejos? Have you visited Festejos Bar and Grill? If so, and you live in one the Fred Smith communities like Riverwood Golf Club, LionsGate and Riverwood Athletic Club, share your thoughts with us about Festejos below. What’s your favorite thing to order?